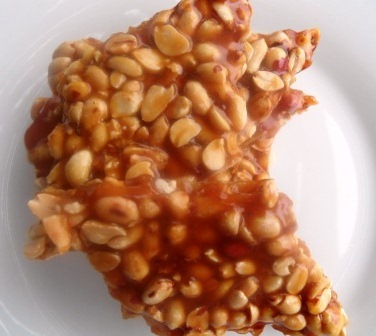 Chikki is the perfect snack to ease the sugar craving after a meal. Good to carry around in your purse for snack attact, it is pure simple peanuts coated with jaggery. Chikki is actually very popular in winters as jaggery provides warmth to the body. It is also a healthier alternative to sugar based brittles because of the natural form of cane sugar. Moreover kids love it as it is sweet and crunchy and just like eating candy. My mom always used to stack some at home. She would prepare it all the time. It is so easy to make and can be stored in air tight boxes for ages. Roast the peanuts and when they have cooled, rub them together to remove the covering. Heat the butter in a pan and add the jaggery. Keep stirring till the jaggery begins to thicken. The jaggery is ready when a drop turns into a ball in a cupful of water. Take off the heat and mix the peanuts. Quickly spread on a greased plate/cookie sheet/baking tray and roll it with an oiled rolling pin to get an even surface. Cut the chikki into diamonds and leave it to cool down completely. Break the chikki along the indentations and store in an air tight container.